Arisen in New York City, New York in 1993 from the ashes of one of the most influential US black metal bands of all time, HAVOHEJ ('Jehovah' in reverse) came forth by Paul Ledney originally as a vessel for continuing the Profanatica legacy. Ledney also has credits with Incantation and Revenant. A 1993 7" single, 'Unholy Darkness And Impurity', saw issue via the suitably titled Desecration Of God Productions. A 1993 7" single, 'Unholy Darkness And Impurity', saw issue via the suitably titled Desecration Of God Productions. Erstwhile Profanatica and Incantation man Brett Makowski performed session guitars on the 1993 'Dethrone The Son Of God' album, a collection of re-worked Profanatica tracks, released through Candlelight Records. Later, HAVOHEJ were to evolve into one of most (if not THE most) original sounding form of pure blackness ever. Follow-ups included 1994 EPs 'Black Perversion', on JCS Records, and 'The Black Mist', released on Ax/ction Records. In 1996 the Grinding Peace label re-issued 'Unholy Darkness And Impurity'. HAVOHEJ returned in 2000 with the Necroscope single 'Man And Jinn', featuring cover versions of Venom's 'Leave Me In Hell', Impaled Nazarene's 'Goat Perversion' as well an original of their own. September 29th, 2007 the band made a shocking very first and only performance ever at the "Autumn Equinox V". 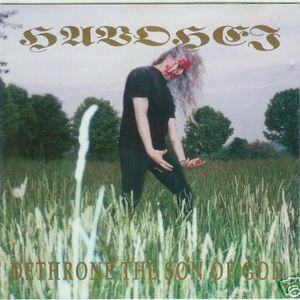 The month prior, the now classic 'Dethrone the Son of God' was re-issued on CD by Hells Headbangers Records with re-worked artwork & layout. The long over due vinyl format treatment is set for early 2008 in addition to a currently untitled full-length album later in the year. November 30th, 2007 Hells Headbangers Records announced the official release of 'Tungkat Blood Wand' as a vinyl-only 10" MLP. A special edition of 213 hand-numbered copies of this "reverse groove" record, were pressed on vomit-reeking brown vinyl. What followers can expect from 'Tungkat Blood Wand' Paul Ledney simply states in an issue of Metal Maniacs: "It takes a lot of work to police the sounds and ideas without changing; everyone wants to grow and expand. It's natural, but Havohej is un-natural, narrow-minded, and the same thing every time. I have broken major ground on the new recording for Hells Headbangers, leaving everyone in the dust at least five years behind. While they play catch up, I'll plan out the full-length."